The definition of a centurion is a leader of 60 to 100 soldiers in the ancient Roman army. 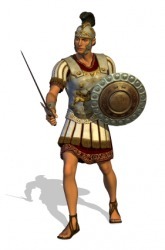 The leader of 80 soldiers in the Roman army in 100 BC is an example of a centurion. "centurion." YourDictionary, n.d. Web. 09 April 2019. <https://www.yourdictionary.com/centurion>. The commander of a century in the Roman army. Middle English from Old French from Latin centuriō centuriōn- from centuria group of a hundred ; see century . An officer of the ancient Roman army, in command of a century of soldiers. (cricket) A player who scores a century. From Latin centuriō, from centum (“a hundred”).